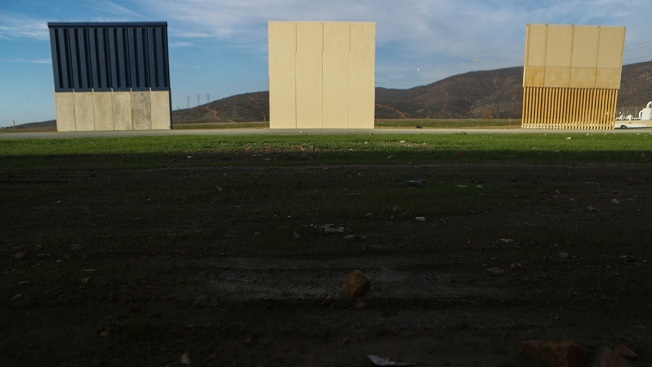 President Trump's border wall prototypes are displayed on the U.S. side of the U.S.-Mexico border on Jan. 9, 2019, as seen from Tijuana, Mexico. President Donald Trump has been briefed on a plan that would use the Army Corps of Engineers and a portion of $13.9 billion of Army Corps funding to build 315 miles of barrier along the U.S.-Mexico border, NBC News reported, citing three U.S. officials familiar with the briefing. The money was set aside to fund projects all over the country including storm-damaged areas of Puerto Rico through fiscal year 2020, but the checks have not been written yet and, under an emergency declaration, the president could take the money from these civil works projects and use it to build the border wall, said officials familiar with the briefing and two congressional sources. The plan could be implemented if Trump declares a national emergency in order to build the wall and would use more money and build more miles than the administration has requested from Congress. The president had requested $5.7 billion for a wall stretching 234 miles.